There was something to be said about that walk. About a quiet, miserable walk lit only vaguely by the flames that reached into the sky. Aside from soft sobbing from her companions there was nothing but the overwhelming emotions going through her mind. Cinder was exhausted, so much so she couldn't even process the thoughts and feelings. She just wanted to lay down, to collapse into a heap and pretend this didn't happen. But she knew even sleep would not erase this. As they approached the Battle Castle the wiped Quilava tried to think of anything she could say, or anything she hadn't said already. The words didn't even formulate; she knew nothing would make this better right now. The light of the flames hardly reached their old shelter and it was Cinder's personal fire that lit the massive doors as she pushed them open. Pausing to sniff for the dangers the fire type instantly felt a sense of nostalgia. This place smelled the same.. it smelled okay. The wood, stone, and mud that filled it was there own and not the remnants of that blaze. There was no fresh scent of death, rot, or blood. No one had been here. Blinking in the dark room Cinder could see nothing had changed and that was enough to put her at ease. Creeping inside she acknowledged the remaining berries from the morning but had no appetite for them. Her body ached and cried out for sleep, and she had not the strength to deny it any longer. Slogging her way to the spots they had slept before the Quilava collapsed in a miserable heap. Blood and ash still marred her pelt. They needed medical attention.. Should they have a watch, or shifts? Exhaustion was already pulling at her eyelids and she doubted the others were feeling much better. "Rest up. We'll need it for tomorrow." She sighed, closing her eyes to the dark, painful world. Save for the crackling blaze behind them, growing more distant with every step, the night was utterly still. Was it this peaceful while they were struggling for their lives? Miyu shifted around with the movement of Rebel’s joints, keeping her eyes fixed on the blurry shapes on the passing ground. The silence hung over the group as they padded back towards the Castle, silence like a black hole they couldn’t escape. The night was darker than she could remember it being before, or maybe it was exhaustion setting in… the smell of fire was heavy in the air but no alarming rot met her nose, no red glowing eyes watching from the distance. The Castle was before them not a moment too soon. The fiery starter nudged the massive doors ajar and the duo followed her into the building. The smell of death was absent from here as well… or was he just immune to it now? His eye wandered over to Cinder who seemed to have given the all-clear, prompting the Jolteon to relax and pad behind her deeper into their makeshift shelter. He trusted her senses a hell of a lot more than what remained of his. Their sleeping quarters were completely untouched. Exactly like before, when they had all been here eating on their foraged berries. It was like a dream, so distant it was practically fiction. The Jolteon lowered his body, his bones making several audible cracks as he did so, so that Miyu could easily drop to the floor. He then returned to the spot designated his and flopped lazily on the floor. "Rest up. We'll need it for tomorrow." Cinder’s voice was finally the one to break the seemingly never ending silence. Miyu took longer than average to settle, struggling find a position to accommodate her leg. When she did, the blackness of sleep was quick to envelop her. Something that usually never happened. Cinder didn't say anything else. No defense, no argument. Bitterness still bore from his eyes as he watched the Quilava turn and walk away. So that was it, they were done here? A silence fell among the group. Did they all feel the same way? Sparks from his staticy fur seemed to build with his frustration, but the further they walked he realized that he too was tired and had little strength left to fight. The gravely, cobble path was so familiar on his paws despite only walking it a couple times. Nostalgia ached in his heart as he recalled that same morning; he had fought with Mel on this path and drove a wedge between them. Now.. would he never have a chance to make up for that..? It took a long time for the electric type to succumb to slumber. It was a struggle just to catch her breath. Melanie's chest heaved with each inhale and exhale as she forced herself to calm down. When had it become night? With no perception of time the large fox had no idea how long she had been laying there. The immediate panic started to fade and other fears found their way in; she was exposed. Angling her nose upward the Ninetales sniffed, searching for any sign or clues. The harsh scent of smoke and ash lingered everywhere, the crackle of the blaze sounding distant. How far had they traveled? Was this still the Battle Frontier? 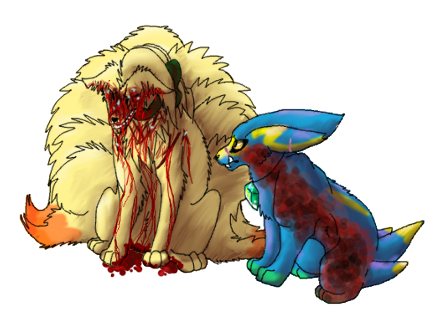 With another breath she confirmed to herself there was no scent of undead, of other Pokemon nearby, and the blood on her own pelt and Faux's had been masked with the mud. They were safe from that.. for now. Moving her head down to Faux the big fox nudged her with her muzzle. Heat still pulsed from her pelt, and her flanks moved with each breath; she was alive. We can't stay here. Licking her nose and cheeks Mel tried to spur her into consciousness, but the Vulpix remained quiet. With a small sigh she grabbed at the older fox's scruff once more and made her way to shaky paws. One leg still would not bare weight but the rest moved with an immense effort. Listening carefully to the crackling and feeling for the direction of the wind Mel tried her hardest to pinpoint where the fire was relative to herself. That must be the Arcade. Taking one step at a time the fox made her way toward it. If she could get closer, if she could just get a bearings on her location, maybe she could find the others. Gentle light filtered into the Battle Castle, giving the space a soft ambiance. The air was cool, crisp, and intruding in a way that the sleeping Pokemon just wanted to curl up tighter and snuggle within her own warmth. It was too early, her brain would say, go back to sleep. But that wasn't an option for the Quilava. For the third day in a row Cinder shot awake, though this time she was not intruded by another. Her body tensed, paws smothering the floor as she woke from a nightmare in a cold sweat. Heart pounding, the fire type had forgotten where she was and who surrounded her. Her flames cracked to life instinctually before she recognized her friends and let the initial panic start to subside. Just a nightmare..
As her heartbeat settled back to a normal pace and her consciousness fully awakened Cinder was made fully aware of the pain that echoed throughout her. A hell of a fight. How had they survived that? The air was damp, much like the day before, but the thick smell of ash seemed to settle around them. With a question upon her lips Cinder turned to see if Faux was awake.. and was greeted by the grave reminder that the fox had not bedded down with them last night. The cold sweat seeped down to her bones as the reality of last night came back. Faux was gone, and the empty space just beyond confirmed Melanie was too. Cinder's heartbeat quickened once more; there was no shiny blue fur in that empty spot, or anywhere in the room. Everything last night was blurring together. Where was Etincelle? Had he escaped, she swore he did. Did he sleep elsewhere? Hadn't he come in here with them, in a safe huddle? ..Had grief driven him away during the night? Swallowing back the fresh wave of guilt Cinder tried to remain calm. Memories of him yelling at her seemed real enough, so the Electrike was at least alive. Where ever he was he had gone himself, and she could only hope he was safe. Rolling properly onto her paws Cinder made a sluggish walk toward the foyer. It was a morning like this that killed Rosko, and the Quilava could not stop herself from glancing over her shoulder as she walked down the hall, albeit in the wrong direction of that event. As she made it to the front Cinder was reminded of the work they had put into this place. The remains of the berries Miyu had gotten were still there, and the repair work on the walls was dry and hardened now. All the rubble was picked up, and undead dealt with. They had all put so much work into this place.. and my greed made some of us not return to it. Guilt tightened like a noose around her heart. I need air. Hobbling to the door the starter pushed it open and stood in the threshold. Outside, a mist had once again settled across the Battle Frontier. It made more a pleasant, cool breeze that blew across her fur, though soon the sunlight would burn it off. With a deep sigh Cinder tried to calm herself and mentally prepare for the work ahead in the day. For the retrieval they had to make. Dragging a paw down her face the weasel could feel the ash, dirt, and blood that clung to each strand of her fur. She hadn't really acknowledged it on the others but boy, they all needed a good wash. Tossing her head back Cinder saw the buckets with water and mud respectively. As much as she wanted to dunk her head in it and wash she knew it would be much much easier to use the spring itself, and that she should wait for the others to wake before heading out. It was a bad morning. Etincelle had been unable to sleep, rousing often and when he did manage to fade into unconscious nightmares plagued every moment. He got up before the others, when light had barely touched the sky, and sneaked away unseen. Anger still burned in his belly as he saw the Quilava and the wounds that littered them all, but he made no motion to act on it. In the silence of the dawn Etincelle had awkwardly padded away and made the journey back to the Battle Arcade. Or, what was left of it. The cold, damp dawn had left almost everything misted with a fine dew. His injured leg made climbing over and through the rubble difficult, but the further he got the drier it became until he could feel heat pulsing from inside. The place was still smoldering. Etincelle sniffed at the debris, climbing through the ash and splinters for any trace of a familiar smell. There was nothing. The wet soot smeared against his already foul fur, but he paid it little mind as he pushed small pieces of wood and stone aside. He had no idea how much time had ticked by but the sunlight had grown much stronger. Faint shadows were now cast, and the small hound could see no motion throughout the little bit of the heap he had managed to explore. An emptiness gnawed at his belly, and the pain in his leg made further exploration a terrible idea. Crawling out of the mess the Electrike shrunk upon realizing how little he had managed to look at, how his tunnel was hardly a dent in a whole world of debris. How he had no idea where to look and caught no fimiliar scents of any of the remaining Pokemon, or even any blood. There was just.. nothing..
Heartbreak choked him as the small Pokemon limped back to the others. Dragging each paw he barely took notice of how black his pelt was, and the gross smells that clung to him. Hopelessness was all that filled him, but with a heavy sigh he kept walking. The others would be awake, he knew, and didn't want to stress the innocent any further. The walk back felt much longer than the one their, possibly due to the intense pain, but when he managed to get back Etincelle could see an unwelcome Pokemon in the threshold of their stay. He glared at her, saying nothing as he shouldered his way past to sit inside the building. Arry was extremely sad as he woke up. He was hungry and wanted a toy to keep him from sadness. In his thoughts, Mel was a mother in a way. The child went over to Miyu and laid next to her. The Aron still wanted the bars, but not until they find Mel. There was one question though that he wanted to ask. Who was it that they was burying yesterday. If it was a sign that the place they was at had a lot of hostility then they was in danger still. One thing was for sure, he wanted to keep Miyu safe. From Arry’s aspect, Miyu was his only friend he’s made since the monsters came around. The only problem is how is he going to protect her from the monsters? His only option was to ask the only undead in their party. Rebel was in a sense a fighter to sort to speak and likely Arry would need to learn from him to fight. There was only one problem, Rebel was electric and Arry was a Steel and Rock type so he’ll have to play a little differently. Hunger did finally get the best of him and he got up to find some food. Arry didn’t have to look far as there was a little bit of metal to fill him up. “Food.” The Aron ran over to the metal and started eating. It was the metal that was extra delicious. The metal was a stainless steel which was even more tasty. With his stomach filled he returned to Miyu and he brought something with him. Though it wasn’t a toy it was stashed in the metal he found. “Miyu? I brought something nice for you. It has a clear stone on it and its hooked to a bunch of little metal hoops.” Though Arry didn’t know what it was, it was a little gift for Miyu. Once the sunlight beamed through the window the stone shined and the light bounced off making all sorts of different colors on the floor. “Oh pretty. It has many colors.” Arry said as he places it by Miyu and lays back down. Now all that was left was to wait to see what happens next. When everyone wakes up, they'll likely leave this horrible place. Hopefully Miyu was feeling better as well since those mean pokemon had hurt her. It was the only reason now to protect her incase that more of them show up. Staring out into the quiet morning was both a great and horrible idea. Her frayed nerves were given a chance to relax, but the calm also brought about reflection and acknowledgement of what they would be doing today. We can't make that rubble their burial site. Would Rosko mind sharing, or did they need to find another plot..? With a sigh Cinder forced her shoulders to sag and push the thoughts away. This was a precious moment and she was squandering it. A second sigh escaped her maw, and squeezing her eyes closed she opened them again with the pull of her paws. Suddenly, there was a shape forming in the mist. Dropping her paws slowly the Quilava stood tense, ready to attack whatever undead was heading this way, but was surprised to find it was Etincelle. The small Pokemon was utterly filthy, limping worse than she recalled, and moving with eyes downcast. "Etin-!" She called out to him, voice quiet but loud enough to carry to him as the pup trod past her without a word. Though his head did not move she could see the daggers shooting from his pink gaze toward her, and felt them remain as he sat inside. Any questions she had wanted to ask seemed answered already; he was at the Arcade, it was a mess, they are with us anymore. Sinking into her stance Cinder let her own eyes land on the floor. "I'm sorry," she finally breathed before getting up and walking back toward their sleeping chambers. Her paws seemed to drag even more so than before, dread becoming ever more real with each step. A shadow crossed the hall but thankfully Cinder recognized it as Arry returning to their nests. He's awake now. Maybe they all are. At least she wouldn't interrupt their nest with lack of news. Making it up to the threshold Cinder knocked twice on the wall to alert her presence before rounding the doorway. "Hey," she started awkwardly, having not planned out what she wanted to say, "morning." 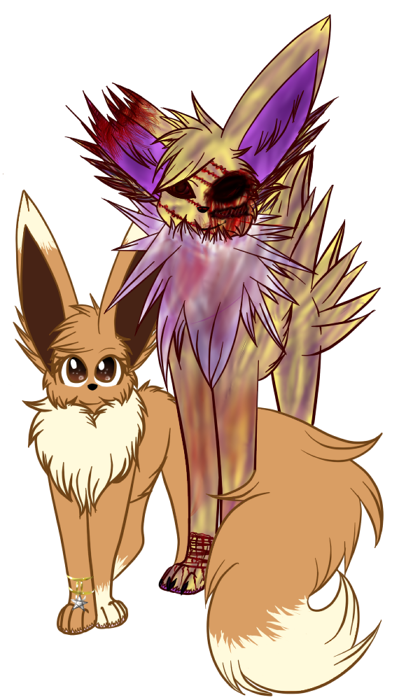 The Jolteon’s eyelids fluttered open, revealing a terribly murderous eye and an empty socket. His fight or flight instinct triggered in his semi-aware state and he sprung to his feet in alarm. She looked at the item before her, aweing as the bright morning sun cast over the stone and projected a small but clear rainbow. She nodded in response, smiling at the sight. “Yeah. It’s an entire rainbow.” Wasn’t there a saying about rainbows after storms? Cinder appeared in the threshold, followed by a very disgruntled looking Etincelle. He silently shoved by her and Reb couldn’t help a quiet sigh out his nose. "Hey," she greeted, though her voice expressed unease, "morning." “Mornin’, Cin.” It was then he realized how similar morning was to mourning and for a brief moment his eye flicked to Etincelle then back to Cinder. He wanted to follow up with something but his mind couldn’t have been blanker unless he had been asked to name every Kanto Champion ever. “Are you feeling okay today?” Miyu asked. She moved her head to look at Etincelle, hoping he would give an affirmation also but she knew he was far from okay. She imagined loss was hitting him the hardest, with Melanie being so dear to him - the kit wasn’t sure if she should hug him or give him space. Etincelle could feel his anger fizzling. It was hard to control, ready to dissipate as he had experienced the truth that Cinder was just as helpless as himself. But even with that knowledge he could not get his fur to lie flat. As she stepped past him whispering an,"I'm sorry," he could feel another choking way of heartbreak fill his being. Did she know..? Etincelle said nothing. Digging his claws into the floor he waited until the fire Pokemon disappeared from sight before walking the same direction to check on the others. Time, he swore to himself, was all he needed. Padding slowly down the hallway Etincelle received wave after wave of memories. He had trod these halls with Rosko, the wind at his back and confidence in his strides. Now he was limping, heartbroken, and feeling like a shell of himself. How could things have changed so severely in the course of a day? With a rough swallow he tried to push the pain away, and shouldered past Cinder who once again thought it best to sit a doorway. As he had thought the others were awake, and he tried to make himself look a little less miserable for their sake. “Are you feeling okay today?” Miyu asked, perhaps noticing his effort though more than likely it was just her caring personality. Etincelle blinked slowly, wondering how red his pink eyes looked after all the emotions that had poured out. How was he even supposed to respond..? His head shook side to side, eyes lingering on the floor as his sullen voice croaked out, "I went to the Arcade." He paused, recounting all the time he spent digging, the pain in his pads, and heat that still burned in the rubble. That couldn't have been the answer she wanted but the Electrike didn't know how to explain what he was feeling otherwise. "It's still burning." He choked on the thoughts, nearly gagging on his own saliva as he forced himself to say, "There's nothing we can do. T-that we c-could have done." OoC)) Gonna have to skip. I've been feeling a bit ill today.